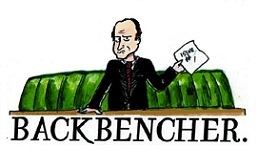 The Backbencher – The Rumble in the UKIP Jungle – Team Farage or Team Carswell? After the recent by-elections in Stoke and Copeland, you would think that it is the Labour party that would be ripping itself apart. They lost a seat to the Tories, the first gain for a governing party in a by-election since 1982, and they hailed their hold in Stoke as a great victory. Plus, a recent YouGov Poll has shown that only 15% of the public think that Jeremy Corbyn would make a better Prime Minister than Theresa May. Despite all this, UKIP is the party that has come out of this the worst! Their inability to win “Brexit Central” and an in-party row over knighthoods has really tarnished the party in recent weeks. 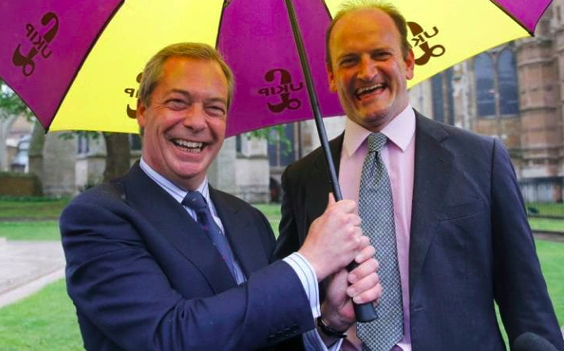 It all comes down to two men; Nigel Farage and Douglas Carswell. According to the former UKIP leader, Douglas Carswell has “undermined everything we’ve stood for” and he should leave UKIP, as he does not truly reflect the views of the party in the House of Commons. This hostility between the two is not necessarily breaking news; the rift between the two politicians has been brewing for several years. But why now? Why has it been making front-page news across the country? Their dispute has been so public in recent weeks due to the issue of Farage’s proposed knighthood. Farage claims that Carswell was negative in response when asked to endorse him in the build up to the New Year’s honours. This has led to a majority of UKIP’s core voters to labelling Carswell as a Tory insurgent who has attempted to rip the party apart from the inside. Obviously, Mr Carswell denies all of this but to make things worse for him Arron Banks (UKIP’s most important donor) has demanded a new party shake-up. It seems that this knighthood scandal was the tipping point for the party and Carswell’s days seem numbered. However, Farage and the rest of UKIP could be labelled as complete hypocrites in their handling of Carswell. When Carswell defected from the Tories in 2014, he did it in the name of being anti-establishment; he did it because he well and truly believed that Cameron’s government was unwilling to change. Carswell is a true believer in his politics and does not need the approval of any individual before he commits to something. The irony in all of this is that the rest of UKIP claim to be all these things. However, they still want and demand respect. Upon his defection, Carswell knew that he would become the most hated man in the commons and that the pressure from all sides of the house would be on him. He is aware of his critics and what the Tories (now UKIP as well) think of him but he acts on his own judgement – which is incredibly admirable due to the harsh nature of modern party politics. This conflict is more than a simple row over a knighthood; this dispute has unfolded into a debate over what UKIP stands for. UKIP wants a “Yes Man” in the Commons, someone who will be the voice of the party hierarchy; it should have been obvious from the start that Douglas Carswell was not going to be that man. Carswell was willing to sacrifice his position in the Conservatives in order to be an outsider and serve under a banner that he believes in and now has achieved – leaving the European Union. Nigel Farage has been promoting this anti-establishment view over in America in his endorsement of President Trump. It is true that “The Donald” is far from your average American politician and it is true that he is far from the stereotypical vision of a US president. Many senior Republican politicians have criticised Donald Trump (i.e. George W Bush, John McCain, John Kasich etc.) thinking that his link with the Republican Party would destroy their electoral hopes. However, for Farage to endorse Trump on the basis that he is an outsider that goes against the Republican Party’s traditional norms is slightly ironic and hypocritical – he criticises Carswell for doing the same thing. Obviously, UKIP and the Republican Party are far from the same; especially in terms of support and size. 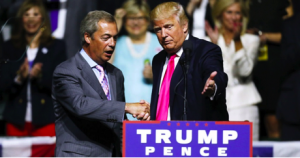 Nevertheless, the principle still stands; Farage demands the same level of respect as a “big” party, yet while he is quick to praise Trump for standing up against the Republican leadership he is even quicker to criticise those that do it in his own party. 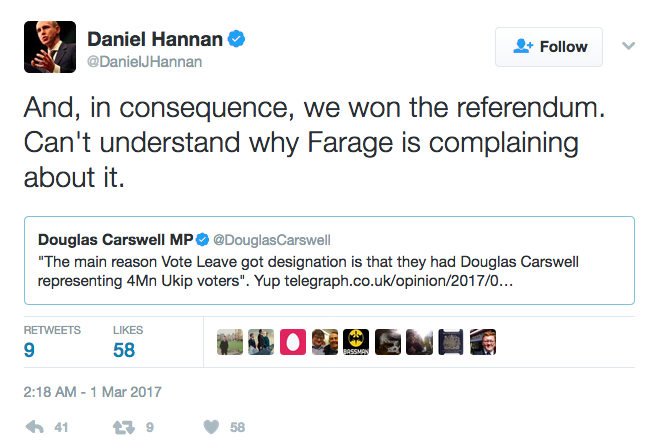 Farage has the support of most of UKIP including Arron Banks – both were leading figures in the unofficial Leave.EU campaign, whilst Carswell has the support of figures such as Daniel Hannan, in what seems to be a losing battle – with claims that Carswell is secretly planning an escape back to the Tories. This dispute has truly ripped UKIP open and has exposed the nastiness amongst their own members. If rumours of Carswell’s future are true, UKIP will need to look at change – like Arron Banks has said. The fact that Paul Nuttall failed in Stoke is an indicator that UKIP needs a refresh and to find what it truly stands for because “leaving the EU” is no longer good enough. Overall, the real issue here is not a knighthood – it is committing offences against a party hierarchy. UKIP and Farage claim to be anti-establishment, however their recent actions have not been faithful to their word. Are they truly anti-establishment or are they jealous because they are not treated as being fully a part of the establishment? Farage is (and forever will be) “Mr. 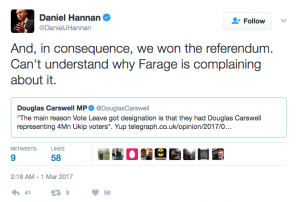 Brexit” but his hypocrisy and treatment of Carswell is clear – and that alone leaves a bad taste in the mouth.